Formed 1 May 1939 in Ansbach from Stab/KG355. A Stabs-Staffel existed May 1939 - Apr 1942. In Feb 1940 2./KG53 became 8./KG28 and was reformed. I./KG53 was disbanded 9 Sep 1944. Reformed 9 Sep 1944 in Varelbusch from III./KG3 for airborne V1 launchings. * 1./KG53 at Varelbusch, 2./KG53 at Ahlhorn, 3./KG53 at Vechta. Began airborne V1 launchings in Oct 1944. Disbanded 15 Mar 1945. * 4./KG53 at Bad Zwischenahn, 5./KG53 at Jever, 6./KG53 at Wittmund. In Jul 1944 8./KG53 became 11./KG53 and was reformed. Began airborne V1 launchings in Oct 1944. Disbanded 21 Mar 1945. Formed Jun 1940 in Giebelstadt as Schulstaffel/KG53. Disbanded Sep 1940, and absorbed by III./KG53. 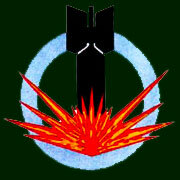 13./KG53 was formed Sep 1942 at Orleans-Bricy. IV./KG53 was disbanded 20 Aug 1944. * 12./KG53 at Vembrechis (Jun 1941 - ?.41), Schwabisch-Hall (?.42 - ?.42), and then Ansbach-Katterbach. 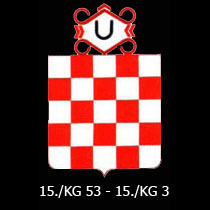 Formed Jul 1942 in Agram from 10.(kroat.)/KG3. Disbanded Jun 1944. * Sarajevo-Butmir airfield was also used. Role: Tactical and Direct Ground Support. 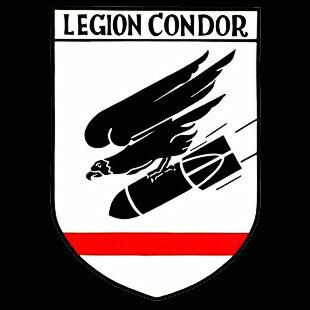 Kampfgeschwader 53 'Legion Condor' (English: Condor Legion) (KG 53) was a Luftwaffe bomber wing during World War II. Its units participated on all of the fronts in the European Theatre until it was disbanded in May 1945. It operated three of the major German bomber types: the Dornier Do 17, Heinkel He 111 and the Junkers Ju 88. 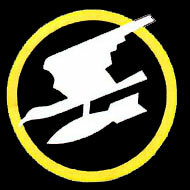 Kampfgeschwader 53 was formed on 1 May 1939 at Ansbach, Germany with Stab./KG 53, I Gruppe, II Gruppe and III Gruppe. The Geschwader was initially put on 'standby' in western Germany, in case of an Allied offensive. As a result, most of its Gruppen did not see action in the campaign. I./KG 53 was put under the command of Luftflotte 1. It had a strength of 31 He 111s, all serviceable. It was committed from the first day, but on 6 September it was moved to Luftflotte 4. The Gruppe lost only 1 aircraft in the campaign. The Geschwader undertook training during the campaign, and did not take part in the battle. Assigned to Luftflotte 2 I./KG 54 was relocated to Wevelgem, Belgium on 1 July 1940. It carried out operations over Britain until 11 May. It remained inactive until 18 June when it was withdrawn to Poland. II./KG 53 continued until the same date. Its targets included night attacks against RAF Fighter Commands airfields, most in East Anglia. It took part in the heavy air fighting on the 18 August 1940, dubbed, 'The Hardest Day'. III./KG 53 continued to support the other Gruppen, all of which were involved in the 15 September raid, known as the Battle of Britain Day. 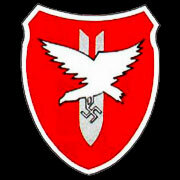 The Geschwader supported the operations of Army Group Centre in the initial phase of the war in the east. It participated in the Battle of Bialystok-Minsk, Battle of Brody, Battle of Kiev and Battle of Smolensk. It supported the push to capture Moscow, which resulted in the failed Battle of Moscow. It was withdrawn to Germany to rest in December 1941 - January 1942. KG 53 supported Fall Blau and the German Sixth Army at the Battle of Stalingrad, and took part in the desperate resupply operation after the Russian counteroffensive had encircled the Sixth Army. Attacks were also carried out in northern Russia, against Leningrad. Strategic bombing attacks were also conducted against Gorki in June 1943, aimed at the Tank factory at Gorkovskiy Avtomobilniy. All of GAZ No. 1 plants 50 buildings, 9,000 metres of conveyors, 5,900 units of equipment and 8,000 tank engines were destroyed. The Kampfgeschwader supported Operation Citadel, and the subsequent Battle of Kursk. On 14 October 1943 the unit took part in a short strategic bombing campaign in Russia. USAAF formations had been flying shuttle missions to Soviet territory after bombing German targets. The operation, named Zaunkönig, struck at American airfields in Russia, as well as Soviet targets. KG 53 and KG 55 took part in the attack. The Russians failed to defend these aircraft from Luftwaffe attacks and the bombing destroyed some 44 B-17 bombers and damaged 26 others. Another 15 fighters were also destroyed. However, the Soviets began Operation Bagration soon after, and the Kampfgeschwaders switched back to supporting ground forces. Most of the units Gruppes were disbanded by October 1944. It appears that the last unit, 14. (Eis)/KG 3 was disbanded on 4 March 1945; its remaining personnel went to KG 76. KG 53 was withdrawn from the Eastern Front in August 1944 and began operations over Britain, flying bomber equipped V-1 flying bombs. Operations were suspended on 25 January 1945, due to fuel shortages, Allied defences and the inability to see the results. Croatian Air Force Legion (HZL) aircrew pose in front of their Dornier Do 17Z bomber in recognition of the unit's 1,000th sortie over the Eastern Front, 16th September 1942. Officially designated '15. (Kroatische)/KG 53'., the bomber squadron was equipped with Dornier Do 17Z aircraft. It arrived on the Eastern Front on 25 October 1941, after training at the Grosse Kampfflieger Schule 3, in Greifswald, Germany. Their first area of operations was near Vitebsk. The rest of the Bomber Squadron's assignments were in the Northern Sector of the Eastern Front, including the bombing of Leningrad and Moscow. On 9 November 1941, the Squadron was congratulated by Fieldmarshall Kesselring for its actions thus far. After flying some 1,500 sorties on the Eastern Front, the Squadron and its aircraft were re-deployed to Croatia in December 1942, to help combat the growing Yugoslav Partisan threat to the Axis foces on the Yugoslav Front. 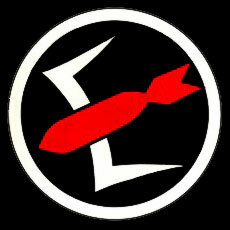 Upon its return the Legion's bomber squadron was redesignated 1./(Kroat. )KG after having flown its nine Dornier Do 17Z bombers from Russia back to Croatia. The Dorniers proved a welcome addition to the strike power of the Axis forces fighting the Yugoslav Partisans on the Yugoslav Front right up to the end of July 1944, when it was incorporated into the ZNDH. In late 1943, a second squadron, 2./(Kroat. )KG was formed to provide operational training. It was equipped with Italian designed and built CANT Z.1007 and Fiat BR.20 bombers. de Zeng 2007, Vol 1, p. 162 - 163.
de Zeng 2007, Vol 1, p. 163.
de Zeng 2007, Vol 1, p. 165.
de Zeng et al., 2007, Vol.1, p. 170.
de Zeng et al. Vol.1 2007, p. 170. Bergström, Christer (2007). Barbarossa - The Air Battle: July-December 1941. London: Chervron/Ian Allan. ISBN 978-1-85780-270-2. Bergstrom, Christer (2007). Stalingrad - The Air Battle: November 1942 - February 1943. London: Chervron/Ian Allan. ISBN 978-1-85780-276-4 . Bergström, Christer (2007). Kursk - The Air Battle: July 1943. London: Chervron/Ian Allan. ISBN 978-1-903223-88-8.